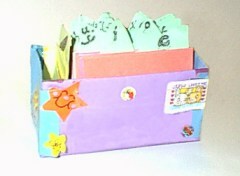 This is a picture of the cards that I made way back around 1996. My daughter was finished with Teach Your Child to Read in 100 Easy Lessons and my son who had gone to public school during k-2 had apparently forgotten everything he had learned about pronouncing words. My son noticed that his little sister, 2.5 years his junior, could read better than he could, and being the logical boy that he is, he asked to be taught these sounds. So during the year of '96 the kids and I sat on the floor of the living room and used the cards to build words. The photo doesn't show it, but in the side pocket are yellow mark-up cards. We used those to break words into syllables and mark the accented syllable. I had just about every imaginable sound combination, below are two - the ie sound and the 3-letter long i.